I dont want to sound like the typical old trumpet or want to write the same old cliche, but sadly its the truth and here it goes. Being a mom of two kids ( i know how typical) i usually dont get the time or have the energy or sometimes its just not my priority looking after myself. Sometimes changing my clothes and taking an uninterrupted long (15 min) hot shower seems like the biggest luxury of my current life. But i do like my skin better when its taken care of. these days i dont get the time to go to a Saloon and get a facial. well there are a number of things hindering that. No. 1 being that it kinda gets a bit expensive if i keep an appointment for every week. As much as i would enjoy it.its just not feasible for me. So, with the above mentioned. I still try to some pampering that is not expensive. does not take up much of my time. AND give me good results. Here are some of the things i like to do to keep myself from looking like the crypt keeper. Lemon, Sugar and Cinnamon Scrubs: I usually use this scrubs, while I am in the kitchen making a vinegrate for a salad. Just cut up a lemon, Squeeze all the juice out but dont throw the skin. Take some sugar and put a little cinnamon in it. Dip the lemon in it and rub around your face. You can use brown sugar if you want. The sugar exfoliates, the lemon lightens the skin and the cinnamon give off a really nice aroma. When u have exfoliated for 5 min. Just let it sit on your face for 5 more min. Then wash with cold water. If u have acne just add a little honey in the mixture. This a Miracle powder I tell ya. It has so many uses. You can jump of here and see for yourself. 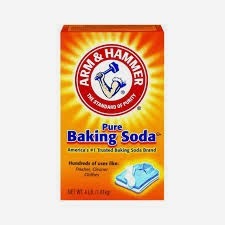 I use it as an Exfoliate, tooth whitener, deodorant and for cleaning my kitchen. But we are talking about face wash here. So here is how we go about it. Just take a very little amount, 1 tsp in your palm. Put a few drop of water or if your skin is really dry like mine some olive oil to make a paste. Rub it on your face in circle avoiding the under eye area. 1-2 min. If u have dry skin dont do this for more than once a week. I put milk on my face afterwards as a toner to soothe my skin. Apart from that i do use the trustee old Saint Ives. 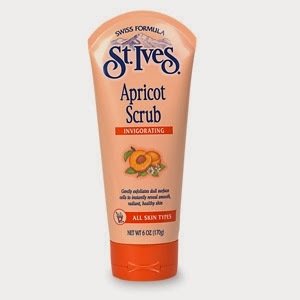 I love this scrub and have been using it since my teens. good for a weekly scrub on the face and an overall body scrubs. Smells good, works well. 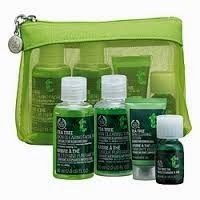 I love the Body Shop Tea Tree oil range when my skin in not doing so well and is breaking out. I usually use its scrub, bleminsh cream and cleansing foam.. You can buy a sample kit before buying the full range. Have a happy healthy Skin people.